Catalonia‘s separatist movement appears split a year after the region’s fruitless declaration of independence from Spain, with some pressing ahead on an idealist path to secession and others backing a pragmatic turn. For separatists, the one-year anniversary of the declaration of independence made by Catalonia’s regional parliament on 27 October 2017 remains a failure. Spain’s central government responded to the move by ousting the regional Catalan government headed by Carles Puigdemont, who then fled to Belgium, and imposing direct control over the wealthy northeastern region. ‘We had the impression that we could change everything, that we could win. Now I see a dark future,’ said Carmen Roig, 59, in Arenys de Munt, a separatist bastion near Barcelona which in 2009 held the first in a series of local plebiscites on independence. Teneo Intelligence analyst Antonio Barroso said that ‘what happened after the declaration of the Catalan republic basically demonstrated that independence is not possible’. The path to independence collided with the intransigence of Spain’s central government and the national constitution, which declares that the country is indivisible. And despite the arrival of new socialist Prime Minister Pedro Sánchez – who depends on Catalan separatist parties to pass legislation – Madrid still refuses to allow any referendum on self-determination. Faced with this barrier, the separatist camp has become divided between supporters of Puigdemont and those of the more pragmatic ERC party, both allied in the Catalan regional government. Sánchez has been more open to dialogue with Catalonia than his conservative predecessor Mariano Rajoy. This in turn has fuelled the divisions among separatists who are split over how to respond, said Gabriel Colome, political science lecturer at the Autonomous University of Barcelona. This has prompted Puigdemont and the more radical camp to continue to push for independence. ‘It could come from one day to another, like (the fall) of the Berlin Wall,’ said Josep Manel Ximenis, the former mayor of Arenys de Munt. 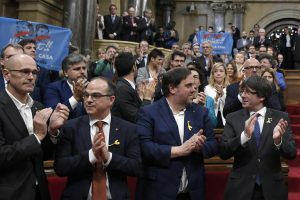 Puigdemont on Saturday will launch a new party called ‘Crida Nacional per la República‘ (the ‘National Call for the Republic’) on the anniversary of the declaration of independence. Three days later, on 30 October, Puigdemont will present a ‘Council of the Republic‘ – a sort of Catalan government in exile in Belgium, although separatists already rule Catalonia. Colome said a significant number of Catalan voters are taken in by what he termed a ‘surreal’ discourse. ‘Around one million people firmly believe there is a legitimate president in exile and that there is no democracy in Spain,’ the analyst said. On the other side of the chessboard, ERC and a part of Puigdemont’s former party PDeCAT have adopted a more pragmatic stance. ‘A year later, they arrived at the conclusion that the unilateral path was a mistake,’ said Colome. This faction now wants to drum up more support for independence so that more than half of all Catalan would be in favour of it, instead of just the 47.5% who cast ballots for separatist parties in the last regional election, he added. Barroso said this push could take 10-15 years. ‘Making a moderate turn is very difficult after having mobilised the base so much,’ he added. The powerful grassroots separatist organisation ANC (the Catalan National Assembly), which has staged massive pro-independence street protests in Barcelona, ‘piles on the pressure’, Barroso said. The ANC has threatened to withdraw its support for the Catalan regional government unless it publishes by the end of the year a clear roadmap to achieve independence. The trial of 18 former Catalan leaders over their role in the separatist push, expected to start in early 2019, also helps to keep the separatist camp mobilised. ‘Without these “political prisoners”, the separatist movement would not be as strong as it is at the moment,” said Colome.